Extremely efficient, robust, lightweight, compact and easy to install: You benefit directly from the innovative solutions in our new Ex linear luminaires, available with or without the emergency lighting function. R. STAHL’s explosion-proof linear luminaires are available in two versions, the first boasting the most sophisticated, innovative LED technology, and the other a conventional version with T8 fluorescent tubes. As standard, they come with an electrical connection on both sides, five-core through wiring for installation in light strips and a new sealing system for degree of protection IP66 / IP67. 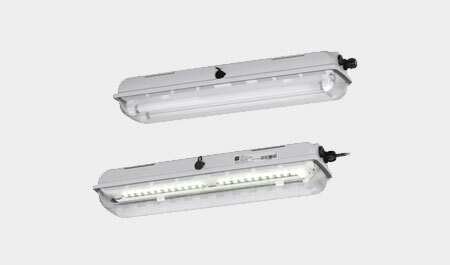 The EB fitted to the reflector plate makes our Ex linear luminaires particularly easy to maintain.